If you’re facing a cracked screen that’s so damaged that it’s hard to use your device, you have a number of options for repairing it. A lot of businesses offer low-cost screen replacement, but before you use those, read this article. If you’re not careful, you could end up violating your warranty from Apple and losing all the support and benefits it offers. Unfortunately, the standard warranty that comes with the iPhone doesn’t cover accidental damage (this is true of consumer electronics generally), which means that a cracked screen isn’t something that can be fixed for free. But that doesn’t mean you should automatically go to the cheapest repair shop. One crucial term of the iPhone warranty is that if the iPhone is opened by anyone other than an Apple-authorized tech, the entire warranty is automatically voided. Virtually all of the cheap repair shops are not Apple authorized, so saving money with them can mean that you lose your entire warranty. So, if you need a repair, the first thing you should do is check to see whether your iPhone is still under warranty. If it is, get support directly from Apple, the phone company you bought the phone from, or from an Apple authorized reseller. One nice bonus of having Apple fix your phone is that as of August 2014, Apple Stores can replace screens without having to send your phone out for service, so you’ll be back using your phone in no time. The situation is fairly similar if you purchased an AppleCare extended warranty. In this case, it’s even more important that you go directly to Apple, since using an unauthorized repair shop will not only void your standard warrantybut also the AppleCare warranty, meaning you’re just throwing out the money you spent on it. Unlike the standard iPhone warranty, AppleCare does cover up to 2 incidents of accidental damage, with a US$79 fee for each repair. This is likely more than an unauthorized repair shop will charge, but it maintains your warranty and ensures that your repair is performed by the people best trained to do it. If you purchased iPhone insurance through your phone company or on your own, you should check with your insurance company to understand their policies around screen repair. Most iPhone insurance covers accidental damage. Depending on your policy, you may have to pay a deductible and a repair fee, but that may cost less than replacing the iPhone entirely. If you do have iPhone insurance, though, make sure to get all the facts and fees before committing to using your insurance, as many people complain about bad experiences when using insurance. If you don’t have warranty or insurance coverage, you’ve got more options. In this case, choosing a low-cost repair shop may be a good idea since it will save you money. If you don’t have a warranty or AppleCare, you have less to lose by using one of these shops. It’s a good idea to use a shop that’s experienced with iPhone repair and has a good reputation. Even though they can’t violate a warranty that’s no longer in effect, an unskilled repairperson could cause additional damage to the body or interior electronics of your iPhone, which will cause more problems and could lead you to needing to buy a new phone. If you’ve had your iPhone for more than two years, or would consider switching to a new phone company, you’re likely eligible for a discounted upgrade to one of the new models. 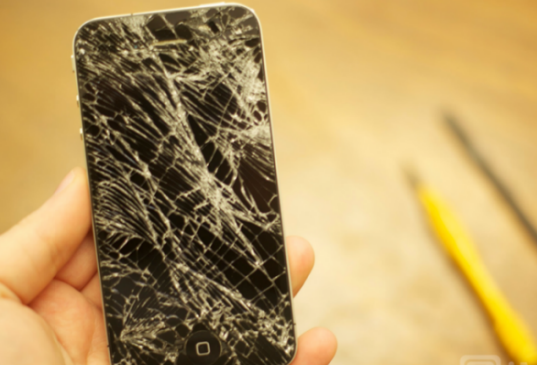 A cracked screen might be a great motivator for an upgrade. A case – Some cases offer screen protection, some don’t. Either way, protecting your iPhone with a case will reduce the possibility of damaging its screen. Screen protectors – These thin, plastic overlays generally protect the screen from scratches or dings, but they can offer a little extra defense against cracks. A case is a more comprehensive solution, but screen protectors are good add-ons. AppleCare – For your next phone, consider buying AppleCare (if you didn’t in the past). It adds a bit to your overall cost, but it’s worth it to get 2 full years of support and repairs from trained experts. This entry was posted in Tips and Tricks and tagged Repair Cracked iPhone Screens by IosdroneD. Bookmark the permalink.